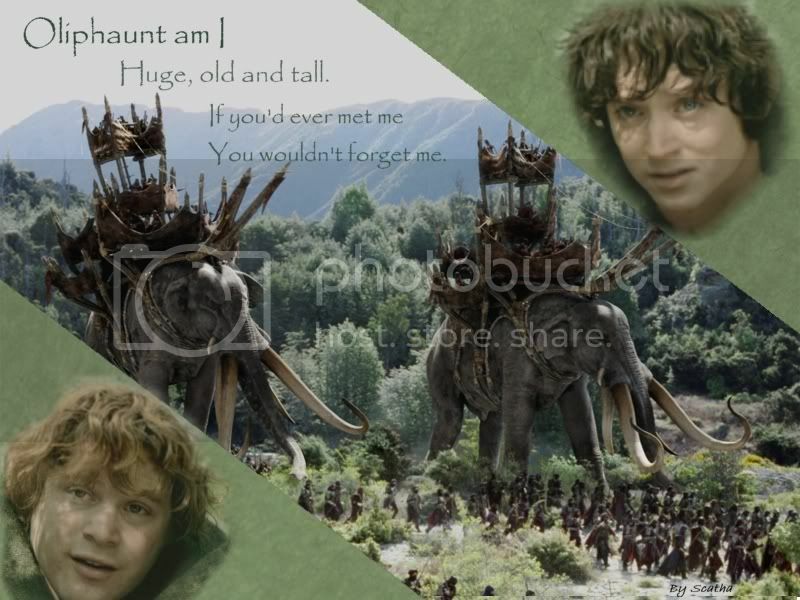 Here is a scene I had not planned to cap, but was so enchanted was I by jan-u-wine’s poem written to it, from Frodo’s POV, about Sam seeing the Oliphaunt, I decided to do it. I’m glad I did. A brief discussion will be followed by excerpts from the book and film script, followed by the caps, followed by jan-u-wine's poem. The caps came out very well, in spite of the extreme contrast in some shots. The bright sunlight in the scene where they hide and watch the battle casts strong shadows from the overhead leaves, the highlights and shadows break up the planes of their faces. I lightened the shadowed areas a little. The look of these shots in terms of the vegetation and lighting reminded me of the farewell scene between Frodo and Aragorn on Amon Hen. I wonder if the two scenes were shot in the same location? In the film scene, Sam is preparing the stew, having his culinary argument with Gollum while Frodo, alerted by a sound, goes off into the bushes. In between cuts to Sam and Gollum, Frodo is shown watching the approach of an army in exotic gear, the Men of Harad. Sam leaves the stew and joins Frodo, Gollum arriving just ahead of him. Gollum tells the hobbits who the Men are. Arrows start flying, and masked archers are revealed in the greenery. Frodo urges Sam to go, Gollum already having slipped off at the first sign of trouble, but Sam stops Frodo, transported by the sight of Oliphaunts. After they have had their look they spring away, but Frodo and Sam run smack into Men, who easily overpower and restrain then. Captain Faramir interrogates them briefly, then orders them bound. Sadly, Sam's nice stew is never eaten, everything left behind. They appear to have gone back and retrieved their gear, however, since they have their packs later on. In the book scene, Frodo and Sam actually get to enjoy their stew before being discovered by the Rangers, who are drawn by smoke from Sam’s fire. After some brief questions to establish they are not foes, Faramir and his company go off to attack the Haradrim, leaving the hobbits under guard, as persons in custody but also for their safety. It is then that Sam sees the battle, and the Oliphaunts. When the battle is over Faramir comes back and questions Frodo closely before his assembled men, afterwards taking the hobbits through the woods to Henneth Annun, and speaking privately with Frodo as they go along. I think the film did quite well here, even if the scene is greatly condensed and somewhat changed. The only thing that is truly different from the text is, as usual for the films, the physical roughness with which the hobbits are treated. Film Frodo, having blundered into a soldier of Ithilien, is picked up and thrown down. Sam is more reasonably thrown down and restrained, since he has drawn his sword. In the book, Frodo and Sam try to hide, hearing the Men coming, but when they see there is no escape, they rise out of the ferns. Back to back they stand to face their captors, swords in hand. Book Faramir, astonished, questions them but does not attempt to seize them physically. When he returns from the battle he still does not lay hands on Frodo. Yet his questioning is grave and shrewd as Frodo stands before him within a circle of his men—"like the trail of a prisoner", Sam thinks—and learns much. Even in this early scene, it's easy to see why Faramir reminds Sam “of wizards” (rather than warm-hearted sons with esteem issues, trying to please cold fathers). As for the film, I do think the EE version is superior to the theatrical, even though it includes some poor or ill-suited material, precisely for moments like the one added here. I am referring to Faramir's pensive, almost world-weary observations about the dead soldier of Harad (lines that originally had belonged to Sam). I think the lines are well-used, if differently, by Faramir. His problematic character in the films makes much more sense when this moment is retained, for it hints that the outwardly cynical and battle-hardened captain is inwardly possessed of a reflective mind and finer feelings. It is in EE scenes, too, that Faramir's gentler spirit is best seen (I am thinking of the EE scene with his brother in Osgiliath, and the EE scenes in RotK with his father, Pippin, and Eowyn). Book scene, from Of Herbs and Stewed Rabbit. In this scene, Sam has gone down to the steam to rinse his cooking things but notices the thread of smoke from his fire. Castigating himself, he hurries back and stamps out the fire, but is alarmed by the sound of birds that don’t sound quite like birds. The two hobbits trussed their small packs, put them on ready for flight, and then crawled deeper into the fern. There they crouched listening. There was no doubt of the voices. They were speaking low and furtively, but they were near, and coming nearer. Then quite suddenly one spoke clearly close at hand. ‘Aye, and what it knows!’ said a second voice. At once four men came striding through the fern from different directions. Since flight and hiding were no longer possible, Frodo and Sam sprang to their feet, putting back to back and whipping out their small swords. If they were astonished at what they saw, their captors were even more astonished. Four tall Men stood there. Two had spears in their hands with broad bright heads. Two had great bows, almost of their own height, and great quivers of long green-feathered arrows. All had swords at their sides, and were clad in green and brown of varied hues, as if the better to walk unseen in the glades of Ithilien. Green gauntlets covered their hands, and their face were hooded and masked with green, except for their eyes, which were very keen and bright. At once Frodo thought of Boromir, for these Men were like him in stature and bearing, and in their manner of speech. Questioned, Frodo provides answers to show they are not enemies. Faramir would ask more but duty calls, and he takes his men off to ambush the army of Southrons they have been anticipating. The hobbits are left under guard with Mablung and Damrod. With nothing else to do they sleep, but Sam wakes to the sounds of battle. Climbing up and peering from a bay-tree, Sam sees some of the battle, including the fall of the Southron close by. Sam it is who, looking upon the dead soldier, wonders where he came from, and what his name was, if he was really evil at heart and would not rather have stayed home. I always have wondered if this reflection was autobiographical, taken from Tolkien’s own experience in the army, in WWI. He wasn’t there that long, sent home very ill with trench fever, but he was there long enough to see the bodies of many dead and dying men. But Sam’s and our ponderings are cut short by Damrod, crying, "May the Valar turn him aside! Mûmak! Mûmak!" I am always struck and charmed by Sam’s last line. It sounds so authentic. My father-in-law, who was a Marine in the Pacific during WWII, said soldiers would sleep anywhere, even in the midst of a siege, if they could, simply because they were so exhausted. They slept where they were, in whatever state they found themselves. I think that fact of a soldier's life gets a witty nod in FotR, when Sam says he can’t sleep because of the tree roots (although in the book it’s Frodo whose sleep is disturbed). Frodo (and every viewer) knows that Sam will be saying otherwise once they’ve been on the Quest for a while. As for the film version of this scene, I think it translated the moment Sam saw the Oliphaunt to film faithfully and effectively. I love to see the delight, fear, awe, disbelief, and elation flicker across Sam's face. Film scene ~ EE dialogue indicated by green type face. Sam is preparing the brace of coneys while Gollum argues with him about the merits of cooked vs. uncooked food. In the meantime, Frodo, hearing odd bird sounds, has gone off to investigate, creeping to the edge of a rise. Sam notices Frodo’s absence as he tends the stew and calls his name. No answer comes. The scene returns to Frodo lying on his stomach, Sam and Gollum joining him. Together they watch an army of Men wearing exotic gear marching in the vale below. Gollum: Wicked men, servants of Sauron. They are called to Mordor. The Dark One is gathering all armies to him. It won't be long now. He will soon be ready. Sam: Ready to do what? Gollum: To make his war. The last war that will cover all the world in Shadow. Frodo: We've got to get moving. Come on, Sam. Sam: Mr. Frodo! Look! It's an Oliphaunt! No one at home will believe this! Frodo: (Seeing that Gollum is gone) Sméagol? Battle ensues as the Southrons are attacked by Men hiding in the bushes, masked archers dressed in brown and green. Frodo: We've lingered here too long. C'mon Sam! Frodo runs straight into a Man. He is snatched up, and thrown down. Sam runs to help, drawing his sword, but is knocked down and subdued. The hobbits are pulled to their feet, but held tightly as Frodo is interrogated. Sam: Oi! Wait, we're innocent travelers! Faramir: (Grimly.) There are no travelers in this land. Only servants of the Dark Tower. Frodo: (With defiance.) We are bound to an errand of secrecy. Those that claim to oppose the enemy would do well not to hinder us. Faramir: The enemy? (Faramir rolls over the dead body of a Southron with his foot and contemplates the soldier’s face, which is young and fair.) His sense of duty was no less than yours, I deem. You wonder what his name is, where he came from, and if he was really evil at heart, what lies or threats led him on this long march from home, if he would not rather have stayed there in peace. War will make corpses of us all.~*Bind their hands. As usual, these caps, taken from the EE of TTT, have been cropped, the contrast, brightness and focus tweaked. ~ Frodo goes off to investigate while Sam stirs the stew. Thinking of how book Sam had so recently recited the old Shire rhyme of the Oliphaunt, the recitation blessedly breaking through Frodo's dark mood and indecision, Frodo must have been all the more elated when his friend saw this beast at last. I think jan-u-wine's gentle poem expresses this notion, and more, as Frodo observes Sam's face. ~ Ithilien: Sam sees Oliphaunts, plus jan-u-wine’s “Grey as a Mouse: Mumak of Harad”. ~ On the walls, and at the Sewers of Osgiliath. ~ Black Gate, Pt. 1: Frodo attempts the Black Gate. ~ Black Gate, Pt. 2: Gollum proposes another way. ~ Black Gate, Pt. 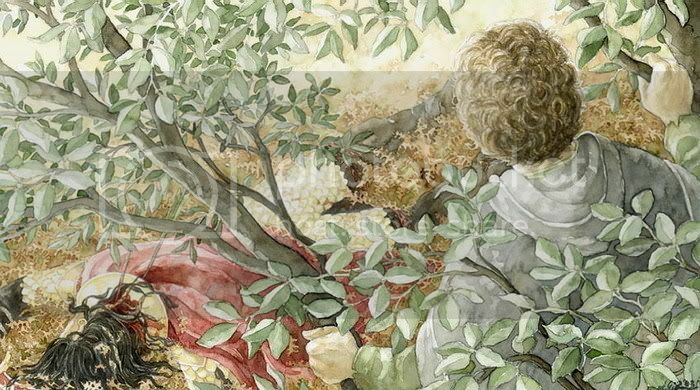 3: Frodo and Sam hide under the Elven cloak. Lovely. And another lovely poem from Jan - very "Frodo". That is so clever, Scarlet! When did you make it? Is this one of the wallpapers posted at War of the Ring? I remember you saying at TORc that you had wallpapers there. Sometimes you'd link them. I know I have the one of Elijah with "his little shadow". Yes, the poem *is* "very 'Frodo'". That was so beautiful! Thank you for putting up those lovely screencaps. Jan's poem, as always, makes me weep. A fascinating poem. I love the half-smile of wonder on Frodo's face when they see the Oliphaunt. Seriously, it's so beautiful when Frodo and Sam have this wonderful moment when Sam sees the oliphaunts right in the middle of this ugly battle. Lovely caps. What an interesting scene, for all its differences. I am glad you decided to cap that scene; it's one of my favourite scenes, both in the book and the film. I love that Frodo and Sam didn't lose their sense of wonder and are still able to marvel at the Oliphaunts, despite their difficult situation. I also think the EE version is better, and gives us an good insight into Faramir's way of thinking. I know that some people hate Faramir in the film, but I find him a complex and interesting character, even if he's very different from Faramir in the book. I think Frodo creeping along to go spy on the Oliphaunts is one of the most beautiful views of him ever. The front view or the back view? Just teasing. He is rather lovely in these, I'll agree. I love the range of expression he has in such a short scene (I'm speaking in terms of screen time, not the time I spend poring over screencaps). Gorgeous film-scene. Thank you so much Mechling! (It is much appreciated that you include the book-version too). Not only do Frodo and Sam not get to enjoy the Coney stew – this is, iirc, the last we see of the tweed coat. Even though they had retrieved their back-packs. The caps of Frodo and Sam enjoying the Oliphaunts are beautifully endearing. Jan-u-wine’s poem touched me deeply. How does she do it?! P.S. The first cap got me thinking (yes even I do that on occasion :-D) The leaf brooches – are they all one size or are some of them Hobbit-size – I must check up on that one. I luuuuurv details.
. You are so kind as usual. But, yes, it’s one of Jan’s best simpler poems. Like “A Gardener’s Gift” (the one in the box of salt post), it tells reams through not that many words; just a few well-chosen images that really resonate. That’s interesting about the brooch, whether they had sets of small ones. My guess is absolutely yes. The regular hobbit actors needed them, but so did their small scale doubles. It’s Kieran who’s being passed along blindfolded up at Henneth Annun (such a tubby tummy! ), and the brooch is to scale on his much smaller costume. Also, there’s the scene in which Aragorn picks up Pippin’s brooch in TTT. When he picks it up, the brooch is to hobbit scale. The tweed coat! Boo hoo! I never noticed the point at which it was no longer in the film, but you’re right: it’s Ithilien. No scene ever shows him taking it off of stowing it or getting rid of it. Maybe he was supposed to have stowed it in his pack? Ithilien was supposed to be quite balmy, spring showing itself as they looked around (in the book). I checked the RotK scenes set in Ithilien, after they would have been released from Faramir, and after Osgiliath, but he is not wearing his coat in those, either. I like the one of Sam's pointy ear, too. Thank you, Frodosweetstuff. I didn't expect the scene to cap so well; I'm so glad Jan wrote the poem or I would not have made them. Yes, the images do make one want to make manips. Such a face!